The group in the statement, described the singer as a "son of darkness," while asking that they are arrested for "insulting the Federal government of Nigeria." 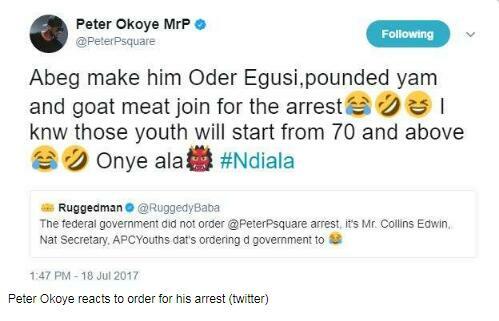 Shortly after the group, in a statement signed by its national secretary, Collins Edwin, called for the arrest of the singers, Peter tweeted, "Abeg make him Oder Egusi, pounded yam and goat meat join for the arrest. I knw those youth will start from 70 and above. Onye ala. #Ndiala." The group in the statement, described the singer as a "son of darkness," while asking that they are arrested for "insulting the Federal government of Nigeria' over abroad video shooting ban.